Wonsam as women’s ceremonial robe was originally reserved for the upper class women but was allowed as bridal attire for lower class women in the late Joseon dynasty. When wearing Wonsam, a headdress and a large belt, for example Gache or Keunmeori, Daedae, Jokduri, or Hwagwan. During the early Joseon dynasty, the form of Wonsam was similar to that of Dallyeong. It had side openings with pleated parts. Red, dark blue, green colors were used for Wonsam. 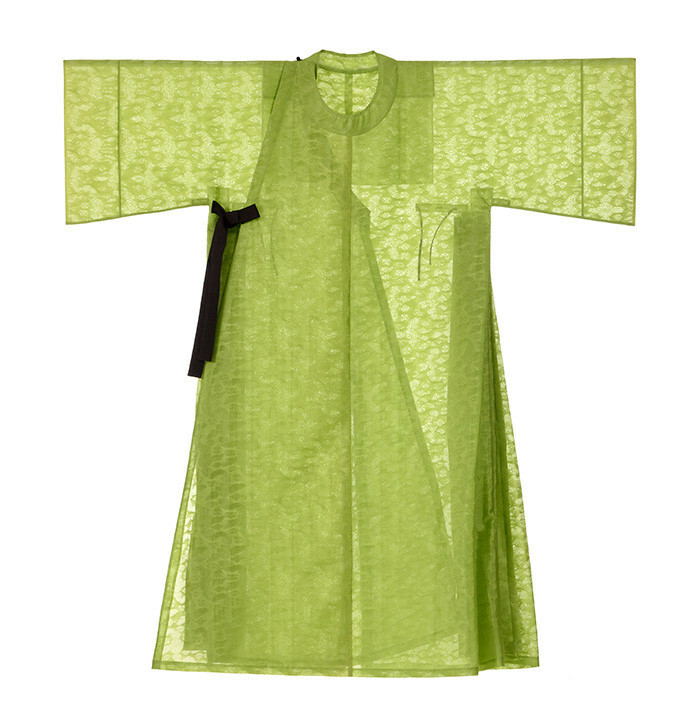 Later the form of Wonsam changed: it took center-front opening style, and sleeves became longer and wider. Multi colored stripes and white wide cloth were attached to the sleeves, and the pleated parts attached to the side openings disappeared. The common color of Wonsam was green, but during the late Joseon dynasty the color of Wonsam varied depending on the wearer’s social status.